Do you know someone who is at risk for a heroin/opioid overdose? The Overdose Prevention Act now allows doctors the ability to prescribe the opiate antidote Narcan (naloxone) to those in a position to help someone else during an overdose of heroin or other opioids. The law also eliminates civil and criminal liability to anyone who administers naloxone. 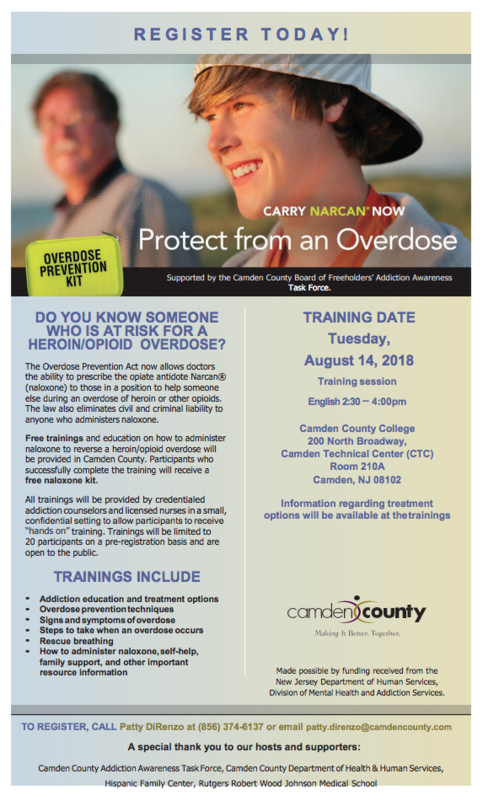 Free trainings and education on how to administer naloxone to reverse a heroin/opioid overdose will be provided on Tuesday, August 14th from 2:30 PM to 4 PM at Camden campus of Camden County College. Participants who successfully complete the training will receive a free naloxone kit. All trainings will be provided by credentialed addication counselors and licensed nurses in a small, confidential setting to allow participants to receive hands-on training. Trainings will be limited to 20 participants on a pre-registration basis and are open to the public.